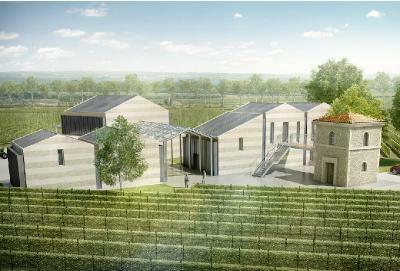 The owners acquired the last remaining agricultural site in Pomerol to build a small winery for their existing Pomerol-produced wine, and to expand their vineyards. The separate functions of this 4,000 square foot winery are organized as discrete structures evoking the character of a small medieval hamlet. While optimizing the functional aspects of wine-making, the design also accommodates groups of visitors to observe the process and taste the wine. Materials are used in an abstract interpretation of the regional style, and an existing historic structure is reconfigured as a chapel.